"Remember the Alamo! is a fast and furious game about the final Mexican assault on the Alamo. The rules are short and easy to learn, but written so players can experience the thrill of this desperate battle. The game includes a full-color map of the Alamo and 84 counters representing Mexican infantry and sharpshooters, Texans and Tennessee volunteers, cannon, and the famous Texan leaders." CONTENTS: Rule booklet * map * 84 counters (including blanks). "Like the original quest to kill Dracula, this game is fraught with danger. But that is to be expected, since putting an end to Count Dracula is as challenging an endeavor as can be imagined. 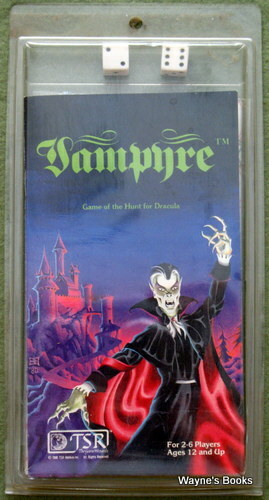 Dracula can be killed, both in the original book and in this game. It requires bravery and the willingness to take terrible risks. But hurry — "Denn die Todten reiten schnell" — ("for the dead travel fast")." "Antares 9 boils with unrest and intrigue. This planet, called Imirrhos by its people, has long been ruled by the Imperial Terran Empire. Although local power is held by seven large family clans (the Seven Houses of Imirrhos) all important matters are decided by the Empire. Now, however, the people of Imirrhos want more freedom, and plots are being laid to rise up and throw off Terran rule. 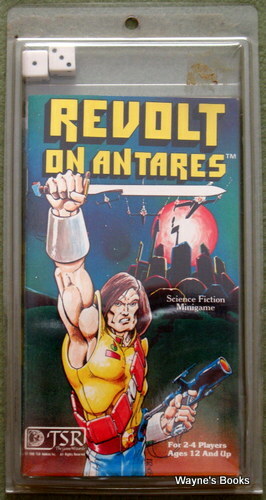 The REVOLT ON ANTARES™ minigame has three different scenarios. In the Basic Game, the Rebel player leads his or her allies in revolt against the Terran forces and the houses that remain loyal. In the second game, the Terran player tries to defend Imirrhos against revolting houses in league with invading aliens, the Silakka. In the third game, Terra is neutral, while up to four players try to create the most powerful house on Imirrhos!" CONTENTS: Rule booklet * map * 84 counters (including 14 blanks). "Something strange is going on in the peaceful Midwestern town of Pleasantville, of that Mrs. Mylniczenko is certain. Close acquaintances of hers have been seen in unaccustomed neighborhoods. Storekeepers normally punctual and courteous have turned stoney-faced and reclusive overnight. Even Kermit Blatz, the cheerful paperboy, has exchanged his smile for a sullen glower. When he speaks to her at all, his eyes seem oddly blank, as if he were locked into a dream from which he could not awake. Mrs Mylniczenko's friends shut themselves away, fearing a wave of some new flu strain is responsible for this bizarre behavior, but the practical housewife knows she must venture into the downtown district today if her family is to have a full refrigerator for the holidays. She has no way of knowing, however, that today is the day of reckoning, a day long-planned for and eagerly awaited by an intelligence unknown to Man. At last, their calculations are complete, their units positioned, every detail of the master strategy alerted and set in action. This is the hour of the Alien, and the people of Pleasantville are about to become the chessmen in a game which might very well decide the future mastery of this planet. The INVASION is about to begin..."
CONTENTS: Rule booklet * map * 61 counters. The early Middle Ages was a time of bold warriors, great deeds, and heroic sagas. Heroes had a philosophy centered around the accumulation of glory and a belief that the only thing of enduring value was to be remembered in the songs and epic tales of their people. Those who successfully performed fantastic deeds were remembered on earth and those who failed were forgotten. Even the gods were thought to shape their values in this fashion. Valhalla was filled with brave warriors who had done many glorious things and proven their right to be accepted into the company of the mighty. Those who had failed to gain glory were left to wander in Hel — a much colder fate. The gaining of glory was important to a warrior in this life and the next. SAGA minigame recreates a mythical time period occurring sometime after the fall of Rome — the age of heroes and Vikings! Each player takes a heroic figure and attempts to perform deeds that will generate enough glory to ensure that the hero's memory will live in the sagas composed after his or her death. To gain glory, the heroes slay monsters, accumulate treasure hoards, recruit lesser heroes ("jarls", or earls) as their companions, and establish kingdoms. The hero who gains the most glory is the one whose fame will live on in the sagas, while the others are doomed to be forgotten by posterity. Each player must be decisive and alert to grasp chances and avoid having other heroes gain glory at his or her expense. SAGA minigame is an invitation to relive the epic ancient days when men and women could be heroes and dragons walked the earth." CONTENTS: Rule booklet * map * 84 counters (including 24 blanks). "YOU are the captain of the Yukon Lady, an oil supertanker. YOU are locked in a frantic race with your competitors through perilous Arctic waters to win the race for oil. Your voyage is fraught with dangers from icy waters and treacherous icebergs. YOU must navigate your supertanker through these hazards under the eerie Northern Lights. 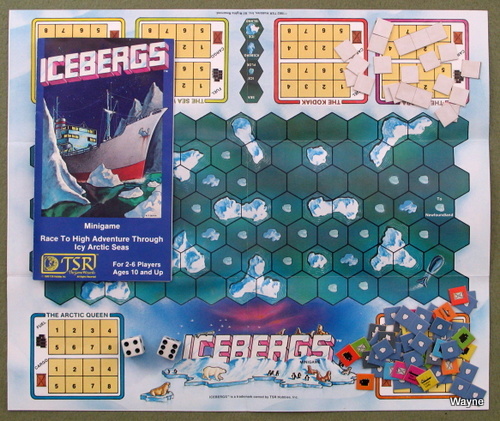 ICEBERGS minigame, from the man who brought you SNIT'S REVENGE game, is a fast-paced game for 2-6 players. YOU captain a supertanker! YOU navigate your ship through the Northwest Passage, dodging ice floes and icebergs, racing other supertankers to be the first ship in port with a cargo of black gold!" CONTENTS: Rule booklet * map * 84 counters (including 43 blanks). "Odin, Chief of the norse gods, broods in his great hall Valhalla and prepares for battle. As time grows short, his warrior maidens, the Valkyrie, bring him noble Norse warriors who have died bravely in battle. Here the chosen warriors will feast and fight, training for Ragnarok — the final battle of the Gods. On that day, the evil god Loki will lead an army of fire giants, and huge monsters against the Norse gods and their human allies. The earth will shake as the greatest battle begins. Lead the Norse gods in their defense of the Tree of Life, or storm across the Rainbow Bridge in search of final victory. Which side will YOU command in this exciting game of Ragnarok?" CONTENTS: Rule booklet * map * 84 counters (including 0 blanks). "The Empire attacks! Buried deep beneath the surface of the planet, Arcturus Prime, the Arcturan High Command thought themselves immune to attack. Then, Vaj Korsen, evil tyrant of the Empire of the Firstborn, appeared above their planet with the Empire's new secret weapon, the planet-destroying Novaship. As the terrible machine approached their doomed planet, the Arctu-rans made a desperate decision. Arming a small mixed group of Eagle and Falcon Starfighters with special torpedoes, they prepared to hurl their best and bravest pilots into a suicidal attack on the Novaship! 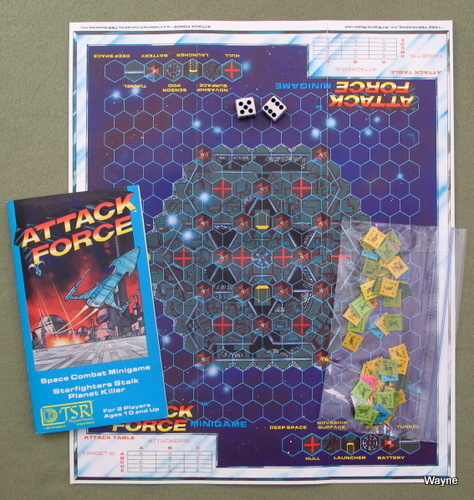 ATTACK FORCE™ minigame is a fast and exciting space combat game for two players. YOU, as leader of the dashing Arcturan pilots, must use your knowledge of the Novaship's only weak point to destroy it before it reaches Arcturus. YOU, as the commander of the Novaship, must use your lasers, blasters and pompoms to keep the Arcturans at bay until you can launch your Cobra Starfighters and destroy them!"